Convection ovens—long a mainstay of professional kitchens—continue to gain popularity with home cooks, many of whom either opt for the compact countertop versions or purchase an oven with a convection setting. The allure of faster cooking times, evenly cooked food, and the oven's improved energy efficiency is hard to ignore. However, for anyone new to cooking with convection ovens, there is a learning curve that often requires adjustments to either time or temperature—and sometimes both. If you're trying to figure out how best to cook with your convection oven, we've got some helpful advice. A conventional oven uses radiant heat that emanates from the top and/or bottom surfaces. The result is usually an oven with hot and cold spots. What makes a convection oven stand apart is the internal fan that circulates hot air, creating an evenly heated environment for the food. The most obvious advantage to having a steady supply of heat surrounding and penetrating the food is that all your meat, produce, and baked goods will cook faster and brown more evenly. Experts and manufacturers recommend adjusting any recipe in two ways: either by lowering the oven's temperature by about 25 degrees or by shortening the cooking time by roughly a quarter. Follow the tips below and carefully monitor your first few attempts for browning, texture, and doneness. It may help to record the results—through trial and error, you will quickly get a sense of how your convection oven cooks and what further adjustments should be made. The convection oven from Bizarkdeal has performed way beyond my expectations. Having tried three other brands and returning them because of their inability to cook hot enough, I had almost given up. 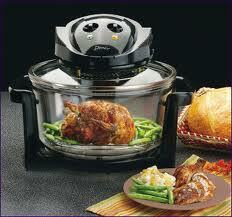 Then I found the Homeleader halogen oven. For me an oven must be able to cook at temperatures in excess of 400 degrees Fahrenheit - no problem for this oven! My Homeleader earned me lots of praise on Chinese New Year with my crispy pork dish. Even the kids liked what I cooked when I used it! Thanks Homeleader!